There have probably been a million or more amazing people, from those who overcame disese or disability to thos whoaccomplished great feats, over jut the past century or so. I am thinking here not of politicians or captains of industry but those who did things for other than personal gain in the power or monetary sense. 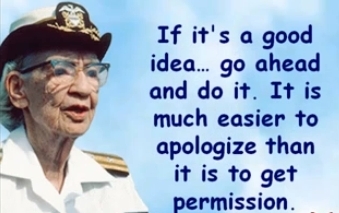 I was reminded of one such yesterday in a radio programme, Grace Hopper, 1906 - 1992. Those computing programming geeks amongst us will be aware of "compilers", we have Grace to thank for them. Rear Admiral Grace Hopper retired, involuntarily, from the USN in 1986, after 42 years service, aged 79. Not bad for a woman judged too skinny and little to join up - until they needed her! ...during many of her lectures, she illustrated a nanosecond using salvaged obsolete Bell System 25 pair telephone cable, cut it to 11.8 inch (30 cm) lengths, the distance that light travels in one nanosecond, and handed out the individual wires to her listeners.